The works of Simon Levy juxtapose the artist's abstract marks, together with the natural patterns and colours of the wood, to create a provocative visual which aims to draw the viewer in. His influences and inspirations run far and wide and include intuitive connections from a basic sense of familiarity to concepts of sensory resonance. "I have had the very good fortune of being surrounded by family, teachers and friends who have encouraged me to follow my heart" he says. He also looks to a number of creative individuals for inspiration, including wood artists, Clay Foster and Craig Nutt, painters, Salvador Dali and Joan Miro, as well as musicians Miles Davis and Stevie Ray, among many others. He cites art and music as being his creative outlets, and whether he is turning or surface detailing a piece in the studio, he will usually be listening to music. "The simultaneous input of rhythm, harmony, improvisation and structure add to the creative stew that I feed on and respond to while working with my eyes and hands". By choice, Simon is a green woodturner, following in a long line of vessel makers, both past and present choosing to create decorative art, rather than functional objects. He views the hollow form as representing containment, with a certain sense of safety and mystery within. Each of his pieces is one of a kind and created in separate but integral phases, involving lathe-turning and surface application. In recent works, the vessels are placed upon or within simply constructed standing frames, bases and wall hangings, which are made from weathered worn wood and found objects. "The goal here is intentional, to please myself first to the very best of my ability, with a complete sense of resolution and respect for ALL in nature." Simon's background is in graphic design, which he studied at the Art Centre College of Design in Los Angeles, California in the late 1960s. He then went on to pursue a career in professional graphic arts, before going on to work in the recording industry where he eventually became a creative director. It was this work that eventually brought him from Los Angeles to Nashville, Tennessee, where he lives today. "I took a weekend woodturning workshop at the Appalachian centre for crafts in Smithville, Tennessee and this sparked a new and unanticipated interest." Soon after, Simon enrolled on a one-week woodturning beginners' course with Clay Foster, at the Arrowmont School and after this, found he was hooked. "Without looking back I knew my new direction and artistic path had been found," he says, "and for the past 12 years I have been a self-employed, full-time wood artist." Levy finds wood to be an ideal material to work with: "Each tree is an individual and every piece of wood contains its own unique characteristics to respond to. This soulful material can be weathered and distressed, be beautiful, or it can be worked, shaped and resolved to a desired finish. For me, the true joy of working with wood is its highly receptive and tactile surface quality." The lathe enables him to create freestanding symmetrical vessel shapes that become blank canvases for embellishment. He chooses to work slowly and methodically, taking 10 to 12 hours to complete a thin walled hollow form. Then, after months of natural air-drying, he remounts the vessel on the lathe, where it is sanded to prepare the surface for detailing. 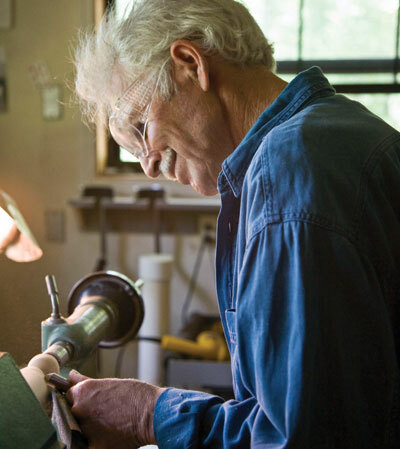 "I tend to spend the majority of my working time off the lathe in my art studio," he says. "By using pyrography and/or low relief engraving, which is sometimes enhanced with pigment, I can spend an additional 50 to 60 hours or more on the surface applications of each piece." Levy is very critical of his own work and strives to produce wood art that is completely resolved, within and without. He ensures that the piece still possesses the life and energy of its natural material as well as evidence of the personal touch of the artist who made it. "I'll spend as much time as is necessary to make each piece look and feel right," he says. The resulting works are a combination of a sense and respect for traditional functional form, applied freehand abstract markings and surface graphics. The response to Levy's unique approach towards the turned wood vessel has been strong and today he is represented by leading galleries and has work in important collections. "Levy's striking pyrography graphics, as well as the external structural elements, elevate the vessel to ceremonial object," notes Kirsten Muenster, director of exhibitions for del Mano Gallery. Levy also maintains a website which enables him to share his work with a larger audience who might never enter a gallery. Today, Levy lives on a small farm in rural middle Tennessee, which is an ideal environment that serves his creative spirit well. "We are surrounded by green rolling hills, meadows and woods," he says. "The peace and quiet of this lush and verdant natural setting is a constant source of wonder and inspiration, this is truly our sanctuary and is an ideal place for me to live and work." "I’ll spend as much time as it necessary to make each piece look and feel right"